We maintain and operate the 1839 Busti Grist Mill, the Miller’s House, and the Busti Museum. 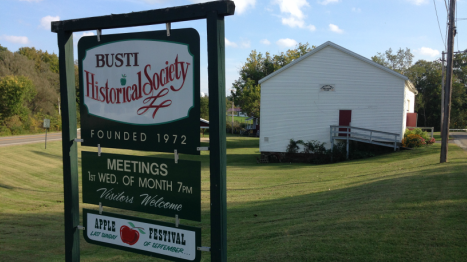 We present the Busti Apple Harvest Festival, the favorite historical craft fair of southwestern New York, every September on the last Sunday of the month. The Mill is a restored and functioning grist mill that can produce flour and cornmeal. The mill is available for tours and use. Read about its interesting history here. 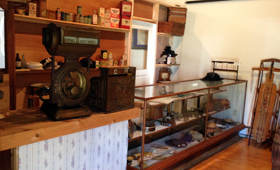 The Museum houses artifacts and photos from the founding days of the town in attractive exhibit settings. It is available for scheduled visits. 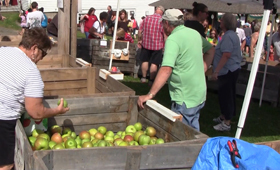 The Apple Festival draws thousands of visitors for a celebration of 19th century culture. The Busti Historical Society is chartered by the New York State Education Department. We are conserving and demonstrating the Busti Grist Mill, collecting and conserving artifacts and records of the town of Busti, and promoting the appreciation and continued knowledge of the pioneer and 19th century crafts and survival skills of the area. Click here to open a GoogleMaps Directions page. The Busti Historical Society owns and operates a collection of buildings just south of the town’s five-corners center. The mill was a functioning grist mill from its construction in 1839 to 1960. Then, in 1969, three teen members of the local 4-H club decided it should be restored. It is now a functioning mill. 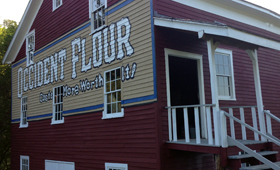 Click these links to read more about the mill’s interesting history and information about how to visit it or to use it for making flour or cornmeal. The museum is open by appointment and showcases photos and artifacts of the early days of the town, including a reconstruction of a one-room schoolhouse. Click here to find out about scheduling a visit to the museum. A roomy open sided pavilion is used for demonstrations and crafts during the Apple Festival, and is the site of the annual town picnic. The pavilion is free for members to use, or can be rented my non-members for events or reunions. The miller’s house was built in the early 1840s. It is currently in the process of being restored, and it will be a showcase of 19th century living. 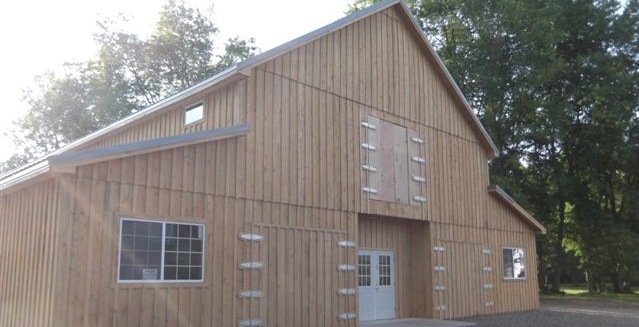 Behind the house, a new demonstration building houses artifacts too large for the museum. During the apple festival, it is used for demonstrations and space for artisans and crafters. The new 60 x 60' demonstration building dramatically expands our facilities for exhibiting larger artifacts and accommodating demonstrations.